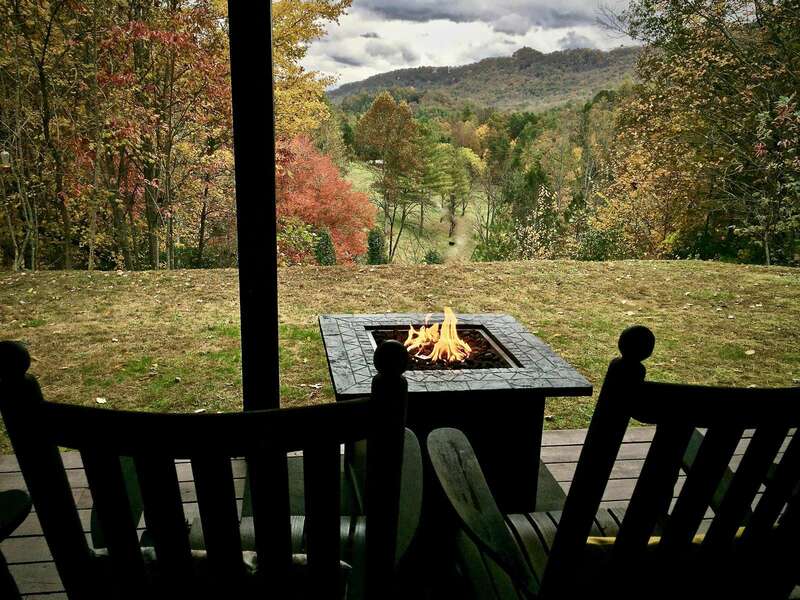 Relax by the Fire Pit and Enjoy the Views... Pasture and Mountain Views from the Sparkling Hot Tub! 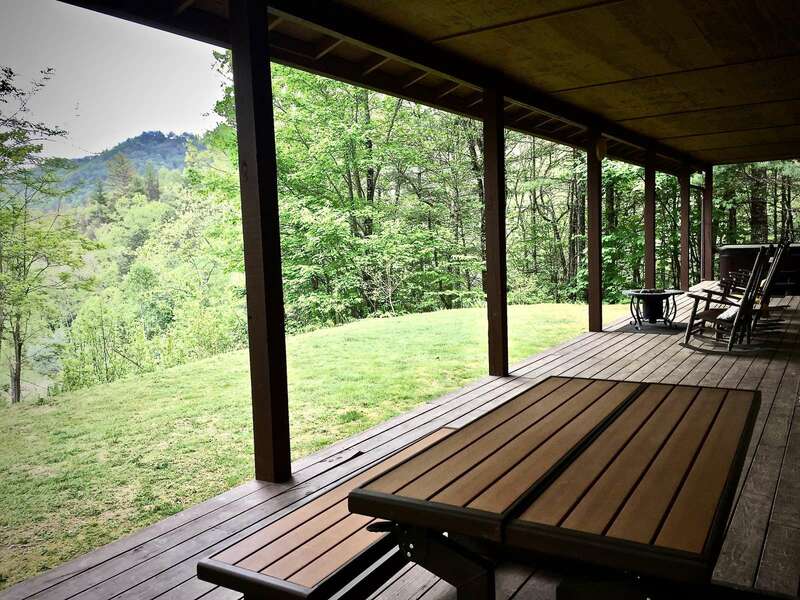 Expansive Covered Deck offers year round all weather enjoyment Large Flat Yard, and on the left, a Hiking trail that meanders through the Forest and leads to a Table along side a small Stream... Pull up a Chair and Enjoy the Views! 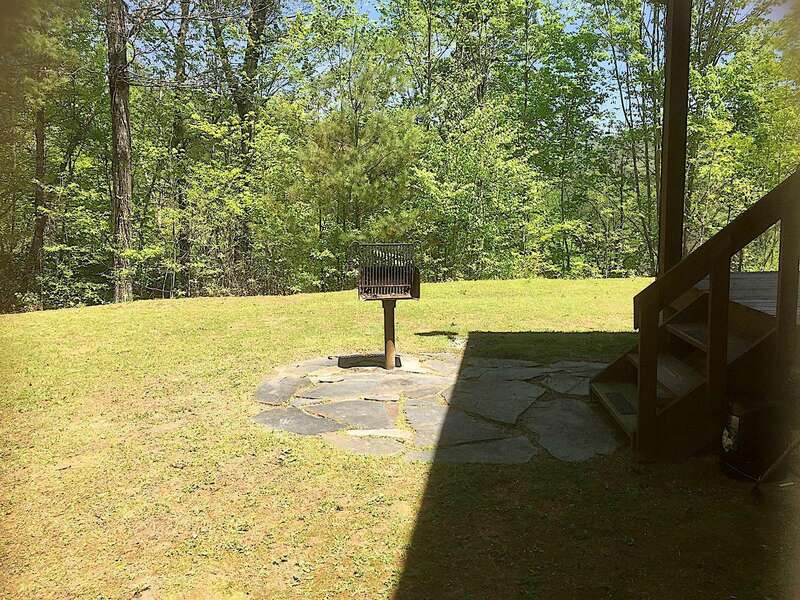 Relax and Enjoy Your FirePit and Views... Secluded Privacy, Views, Located just minutes from the N.O.C.! Open, Light, Bright, and so Comfortable... 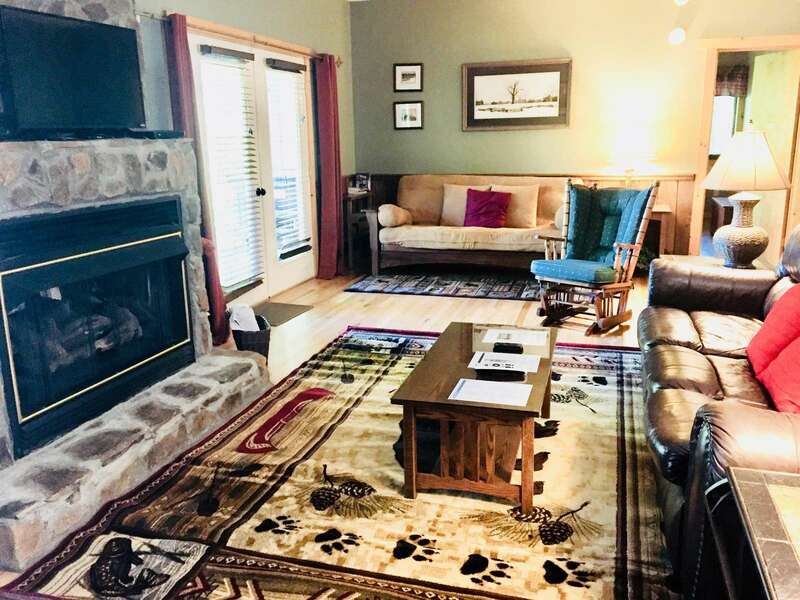 The Perfect place to relax after a day exploring... Open Floor Plan with french doors flanking each side of the Stone Fireplace complete the Living/Great Room Generous Dining Table with additional "leaf's" to enlarge it! The open floor plan is perfect for entertaining! 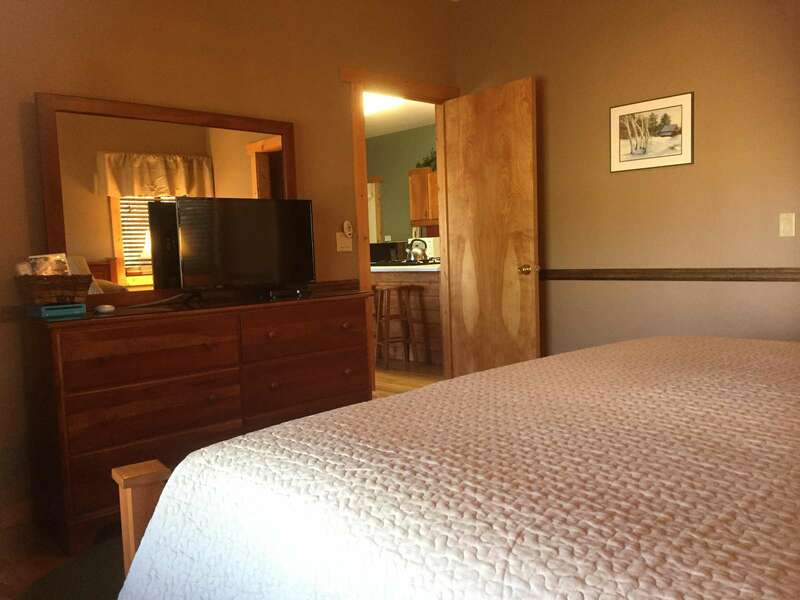 Open, Light, and Well Stocked Kitchen Master Suite offers a King Bed, ensuite bathroom, and a flat screen Satellite TV! 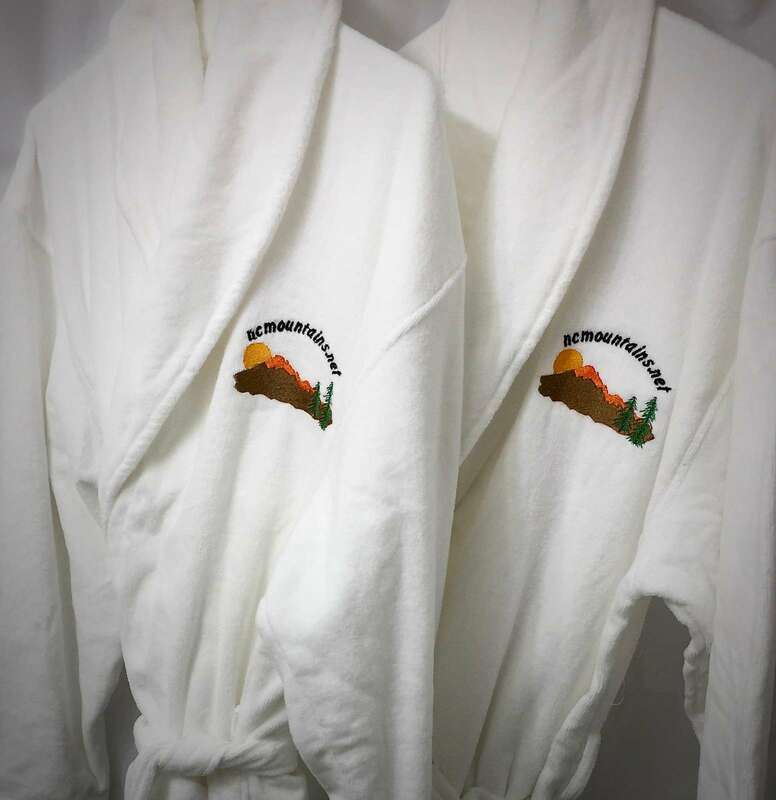 Two King suites and each offers a flat screen TV Two plush bathrobes are available for your use during your stay King Suites, are on opposite ends of the cabin, offers so much Privacy. Perfect for Two Couples! 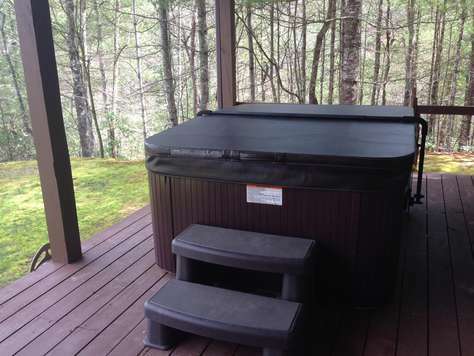 Sparkling Hot Tub is Very Private & Enjoys Mountain Views Large Flat Yard, ideal for Games! 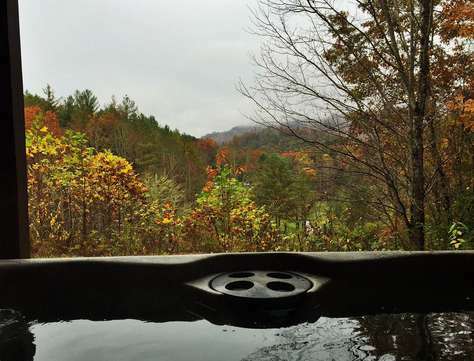 Dine inside, or "Al Fresco"... Lovely Fall Color, and a View that is Breath Taking! 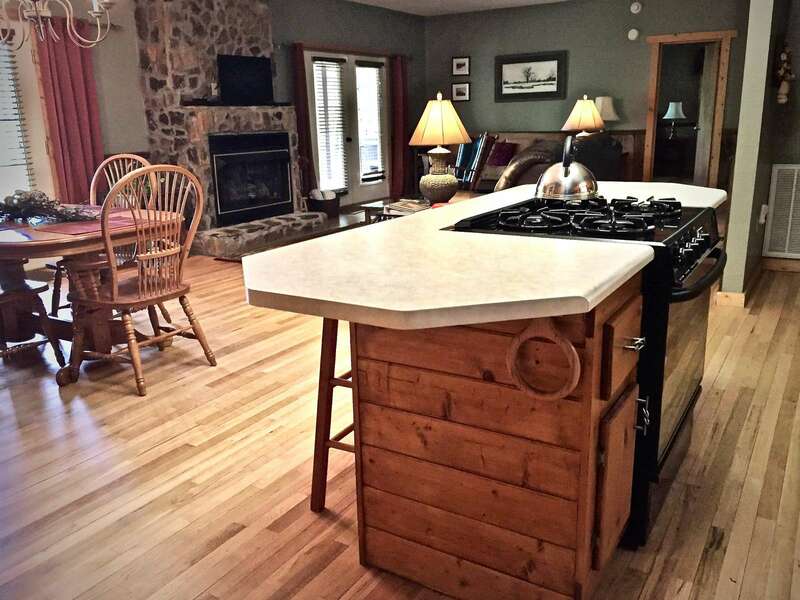 Charcoal Grill is just steps from the covered View Deck Newly upgraded Nature trail meanders through the acreage ... 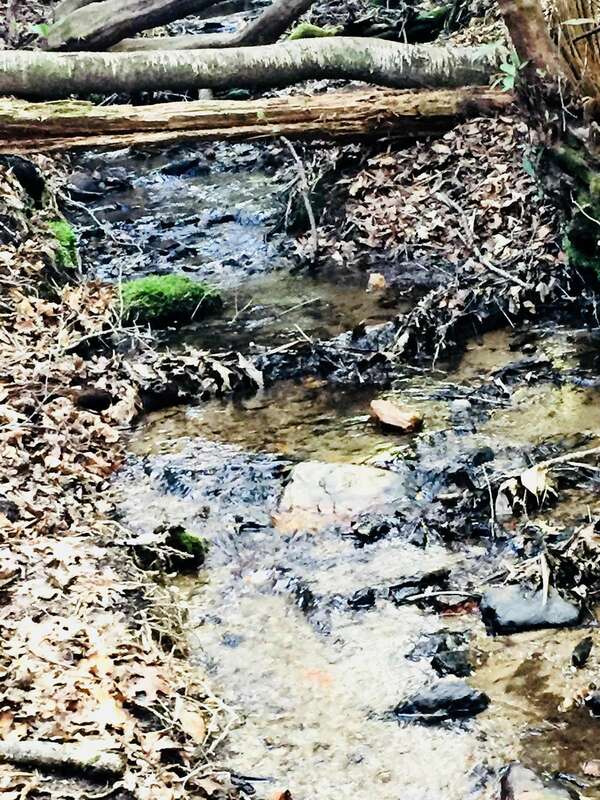 Your Private Nature Trail leads to a little Creek below... 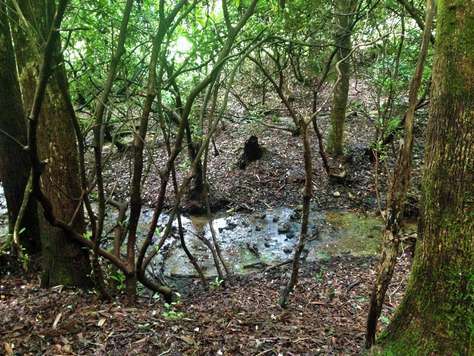 The Private Nature Trail leads to a small stream at the end... 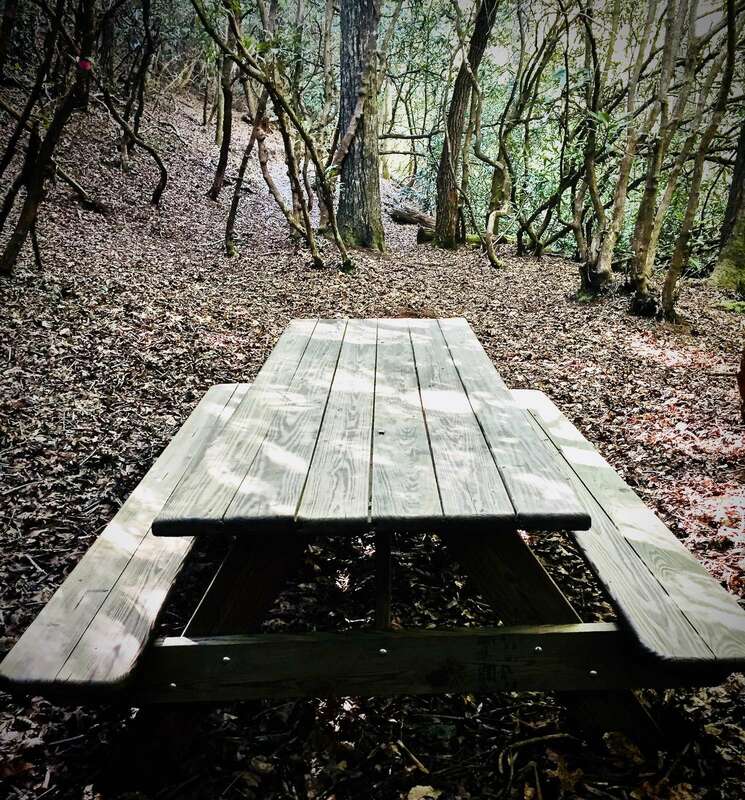 The trail from the back yard leads to a lovely little Creek under a canopy of shade trees PicNic Table at the base of your Private nature Trail offers the ideal place to relax and enjoy the sounds of the stream. "In case you forgot something" size Guest amenities are provided New PicNic Table, Several Rockers, and Lovely Views over the Pasture and Mountains beyond Large Covered Porch to enjoy the Views! View of the cabin as you arrive. There is ample parking for several cars. This property has 2 King(s), 1 Pull Out Sofa(s), 1 Futon(s). Great place to stay while visiting the NOC! The place was wonderful! Beautiful view, easy to access, and very clean and comfortable stay. It was the perfect place for a mountain get away. Beautiful cabin, had a great stay. Well worth it. No doubt about it. 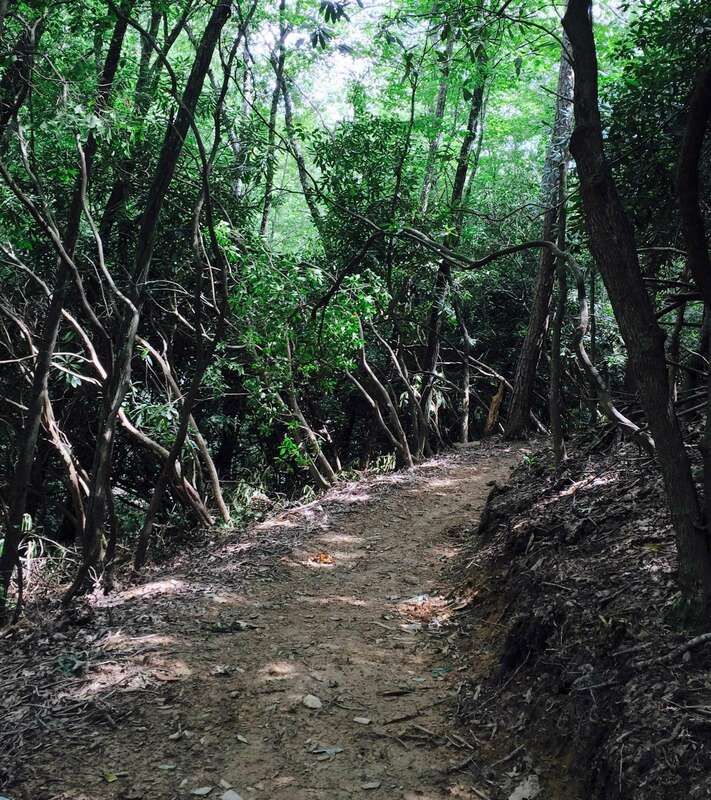 We truly believe we will be returning customers, my family loved to explore and we are very big into hiking and such. Naturally we stay in different area to explore other trail and such, but we must definitely stay in this beautiful cabin again it truly felt like Home. We stayed 6 night for Christmas and it was great, the Christmas tree was set up, the kitchen had everything imaginable for our Christmas dinner, it was great. The cabin was immaculate! The location was perfect! Just minutes away from NOC & Deep Creek! Fontana Lake & View from Fontana Dam was Beautiful! Was so nice returning to cabin after spending the day in the mountains! 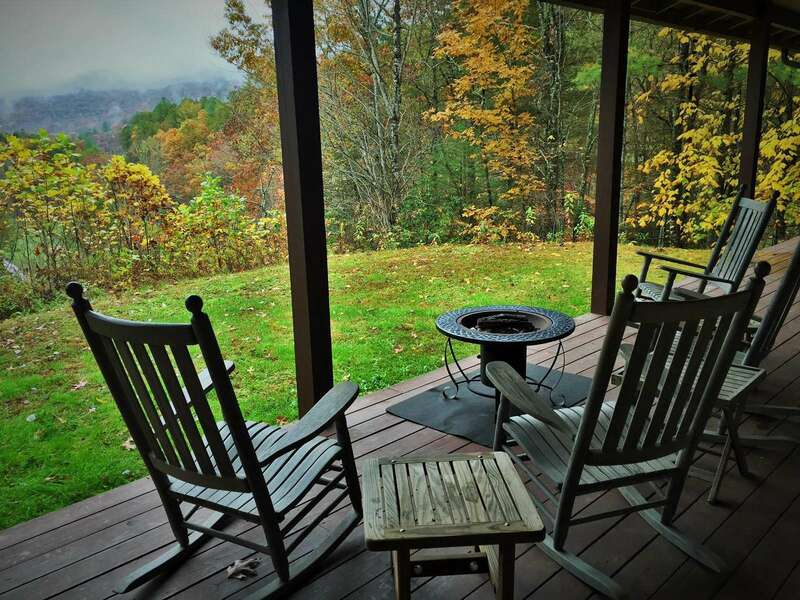 We especially loved the view, hot tub, & rocking chairs on the large deck! There's even a fire pit on the deck & picnic table!! 2 King Size suites on each end of the cabin! The bed was very comfortable! It was nice having TV in each bedroom plus the living room! Walked on the trail on the property twice! We really loved r stay in this cabin & it was very easy to get to! And there was a really nice grocery store close by! Kitchen was well stocked! We ate out 1 time while staying there! Cooked most meals in the cabin! There is so much to do but we ran out of time! Can't wait to return & stay in this cabin again! We Love staying in the mountains! Oh I forgot to mention the lovely gas log fireplace that made it so cozy @ night!! 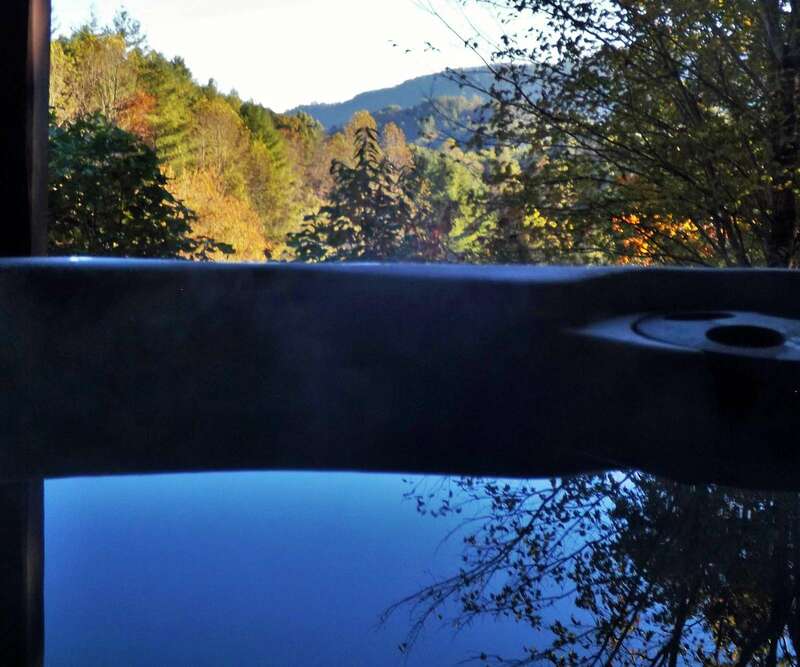 Paddlers Retreat was a well maintained, clean and lovely escape in the Smokey Mountains. 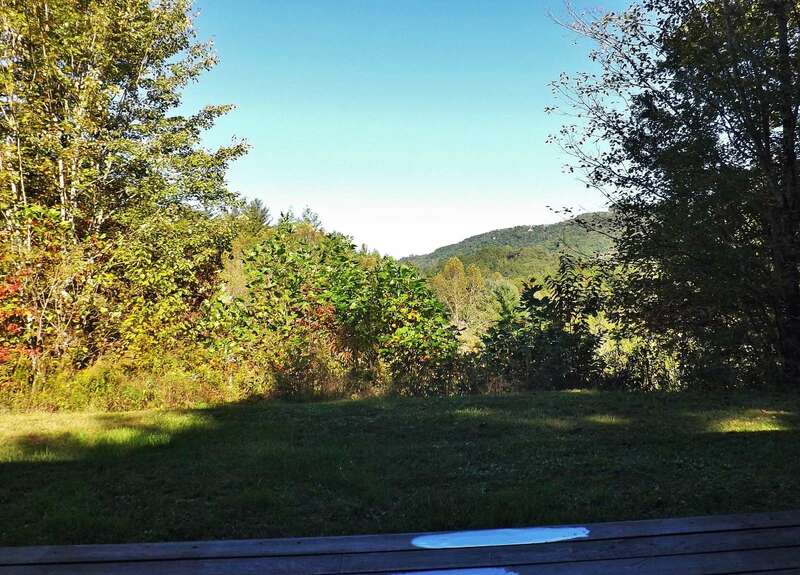 The Front Porch looks over a quiet serene mountain view with a pasture, complete with grazing cows , in the foreground. 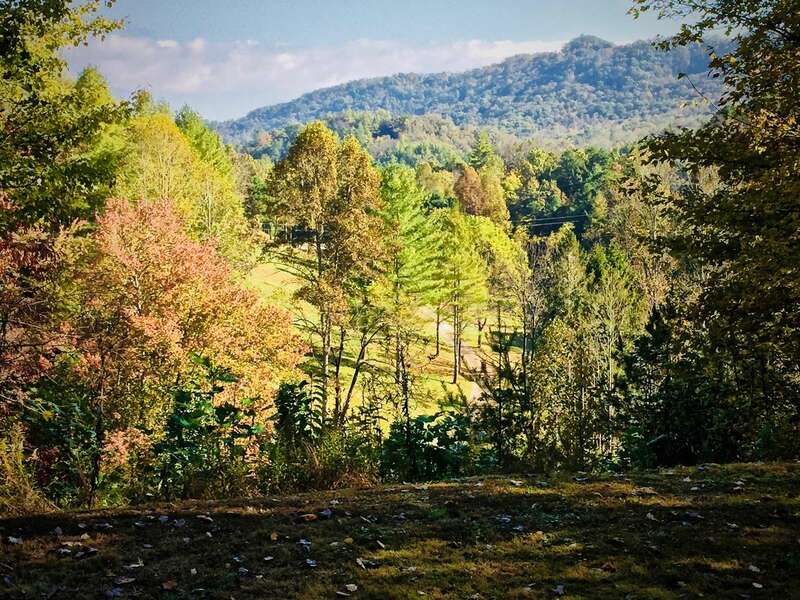 The home offers privacy, yet only a short drive to Bryson City. 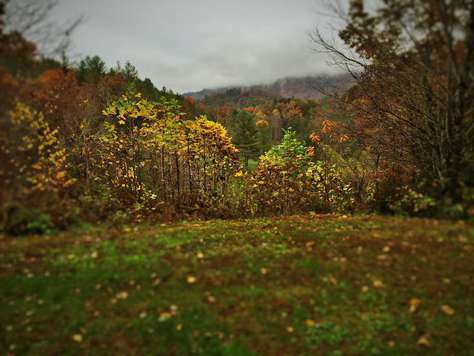 Great Smokey Mountains National Park offers amazing panoramic views of the Smokey Mountains and Valley Pastures. We saw three Elks which are more apt to be viewed in early morning and at dusk. We however happened to be lucky and saw them in late morning by the first visitors center and entrance to the Park. Cherokee is busy and offers quite a bit to do. The home, as I mentioned is well equipped with 3 TVs, 2 King Beds and a Hot Tub ! Lovely time, beautiful area ! Enjoy ! The little cabin was nestled on the side of the mountain in a picturesque and quiet setting. 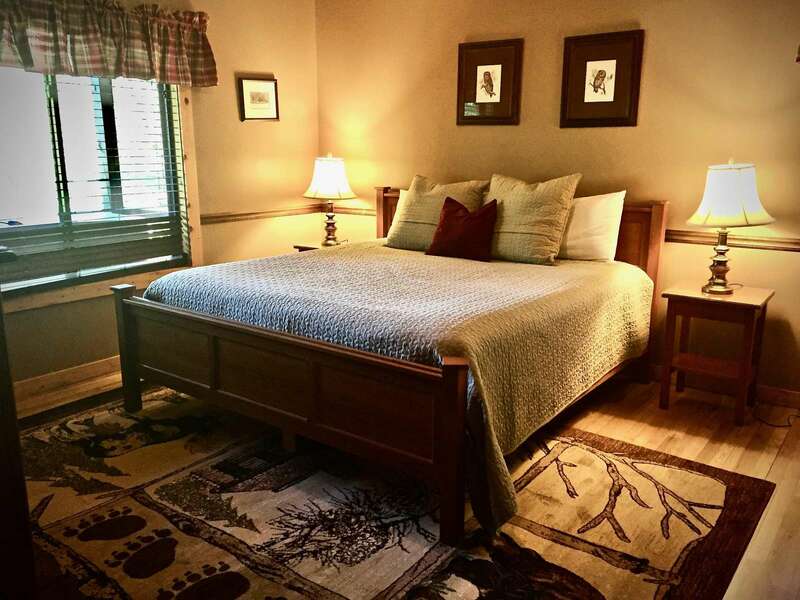 It was clean and well maintained and my husband and I thoroughly enjoyed our little getaway. My only regret was that our stay was too short. We will definitely return, hopefully very soon! This cabin by far was the most wonderful with the morning view as well as the peacefulness of Gods country but yet with never ending outdoor things to do just around the corner! This was the perfect cabin with duel suites , everything you could possibly want right there ! To rock on the back porch and soak in the hot tube as we watched the stars from the hot tub... laughing and chatting about the wonderful family day we had far away from the normal stress of life was absolutely awesome! Don't forget to turn off all the lights and experience more stars than you could have ever experienced seeing, feeling ... almost touching right here in your private oasis!! We can't express how perfect Paddlers Retreat was. Absolutely beautiful inside and our morning view with coffee, stunning. This wasn't a cabin this was a home and we felt for us it was perfect. Everything we wanted to see and do was right within less than an hours drive or less. We had to call once on the hot tub, they were there within 30 mins. The staff is amazing, Kathleen worked with us so hard when an emergency came up and we had to postpone a year, they go above and beyond, you don't find that often anymore. We will be going back over and over. I wish I could give a higher rating than 5, it's a 10 plus. Thank you so much for helping make our vacation everything we dreamed of. 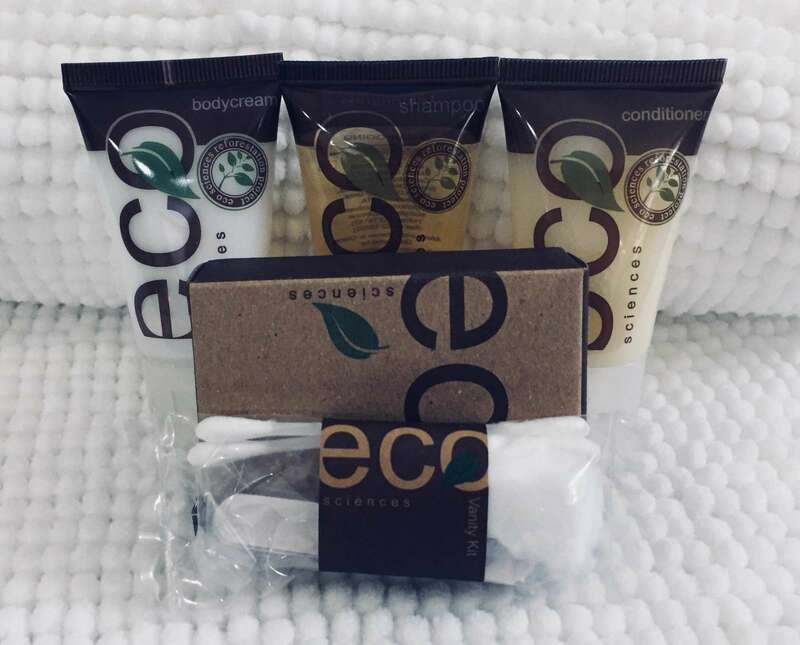 We have rented many properties through VRBO and this was, by far, the best so far! It was conveniently close to the NOC where we engaged in a variety of activities, but still remote and private. The cabin was not only well-supplied with all of the items one would need for even an extended stay, but also equipped with a variety of comfortable seating options both inside and out perfect for just hanging out. Finally, and arguably the most important, it was spotless! We will definitely be visiting the Paddler's Retreat again in the future! We loved staying here! The house was bigger than we expected and was so clean and fresh. The kitchen was well stocked and the view from the porch was breathtaking. We spent every evening enjoying the sunsets! The hot tubs gave the paddlers in our group lots of comfort. Thank you for a great family vacation! My fiancee and I went away for my birthday weekend and picked the perfect place! The cabin is pet friendly, so we were able to bring our 2 dogs. It rained on and off most of the weekend, so we stayed in, but were never bored. They had Wii, board games, TV with cable, and then of course the hot tub which we sat in and watched it rain. We can't wait to return later this summer for another getaway! 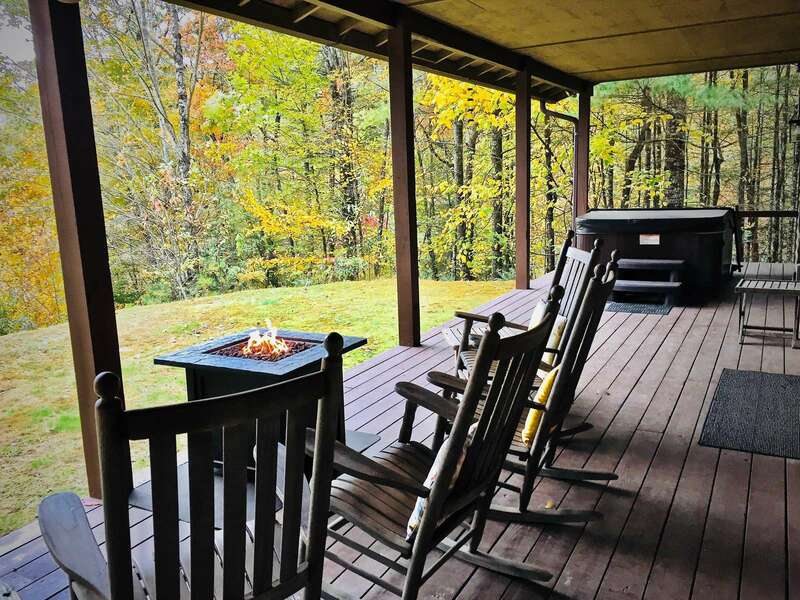 We keep returning to this fabulous cabin because of the comfort and convenience of two king master suites, the proximity to the NOC, the great view and the excellent customer service NC Mountains Realty provides. We're looking forward to a return visit when we can. We really enjoyed out stay at the Paddler's Retreat. It was perfect for our family of 5 to have enough space without being on top of each other. The porch with a beautiful mountain view was wonderful to utlilize in the early morning with coffee and in the evening to relax afer a busy day of touring the area. My girls were able to hang their hammocks on the porch posts to relax and read a book. We very much enjoyed the more quiet area of Bryson City and touring the Blue Ridge Parkway. It has been almost 2 months since our stay and I miss it so much. I would definitely recommend staying at Paddler's Retreat if you enjoy peace, quiet and relaxation. We stayed by Gattlinburg a couple of years ago to tour the Smoky Mountains which had been a wonderful time, but we really enjoed staying in this area as it was less touristy. It was very peaceful and secluded but not that far from Bryson City. Cozy clean cabin, beautiful view. My husband and I spent a long weekend in early November in this cabin. 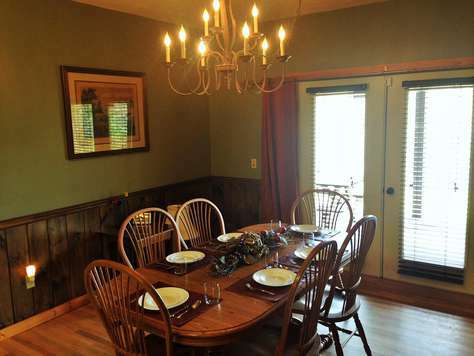 This home is very well-maintained inside and out. 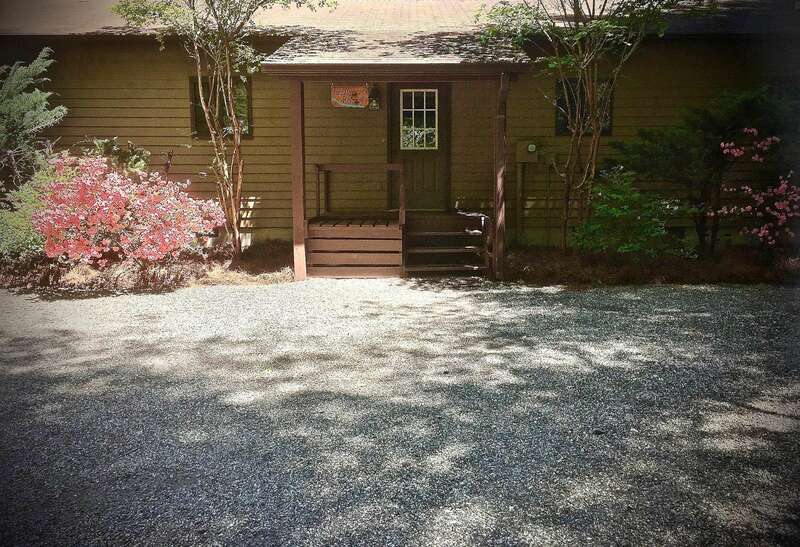 For a cabin in the woods in NC, we were so very impressed with how immaculately clean it was when we arrived. We met Kathleen's husband on our last day while he was blowing the leaves from the property- the care that goes into this property is obvious, there aren't even spiderwebs on the porch!! The layout of the house is great with two master suites on either end and a large open living space in between. It would easily accommodate two couples (or more if you opt to use the two futons in the living room). The living space has the gas fireplace (easy and safe to operate and throws a great deal of heat if you want), plenty of seating, and tons of windows for great natural lighting. 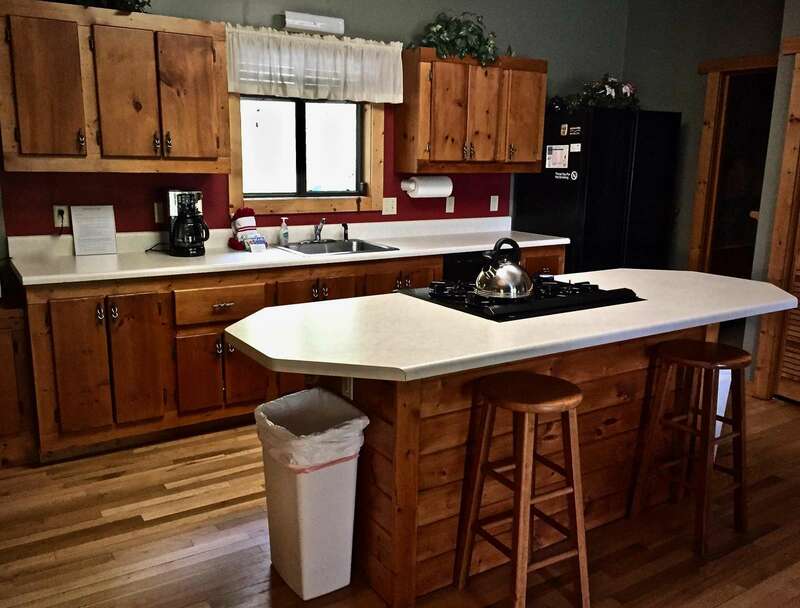 The kitchen is well stocked with newer appliances. The back porch is covered and spans the entire length of the house- we spent a lot of time here with the rocking chairs around the gas fire pit and the hot tub (which was also very, very clean). The backyard is flat and has an incredibly beautiful view of the mountains with a valley below that is pasture space for cows!! The house is private but not creepy or remote- the nearest neighbor sits tucked below the backyard of this property about 50ft down the mountainside - you cannot see them although we did meet their dog "Odie" every day! 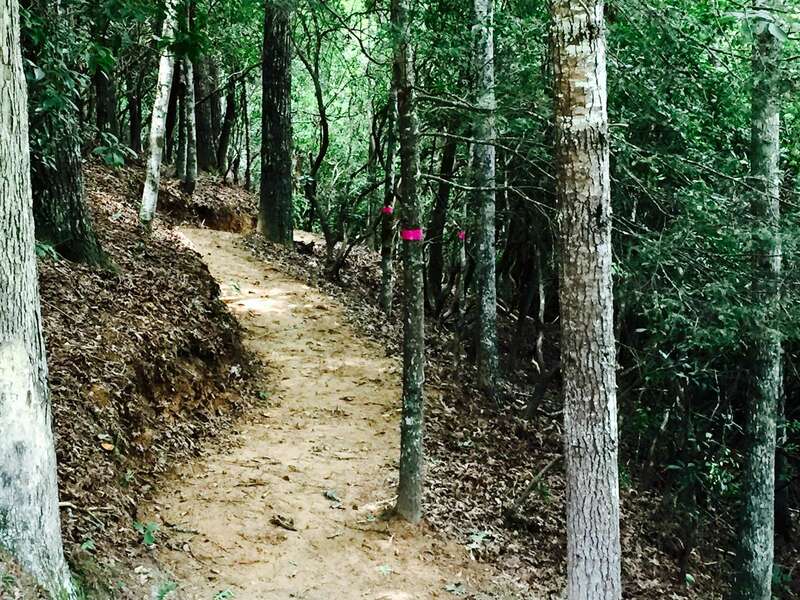 The pink trail to the hammock and small creek is well marked, but we found it to be too steep and slippery (wet leaves!!) to use on a regular basis. There are plenty of hiking trails and things to do in the area and during season, I'm sure the white water rafting is a huge attraction! We very much enjoyed our stay and we hope to return soon!! Literally 5 minutes from NOC. We have stayed in quite a few cabins in this area and this one gets our highest rating. 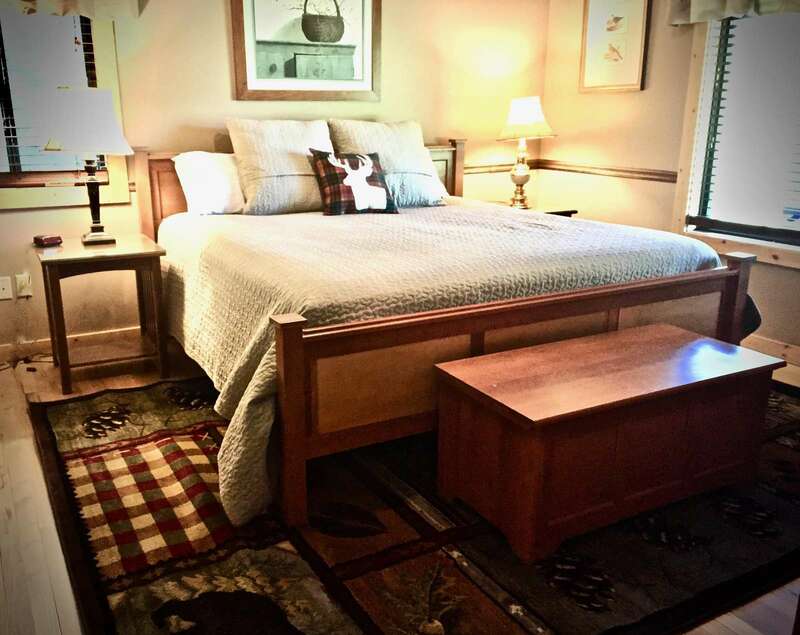 We loved having two master suites with king-sized beds! The common area - kitchen, dining and living room - were roomy and comfortable. There is a gas fireplace that kept us cozy and warm. And the view looking out to the back of the property through the two double French doors was just beautiful. This is our new favorite place. Perfect for NOC lovers! This was our third time to the area and our first stay at Paddlers Retreat. The home is a great location if you want to be close to the action of the NOC but also want to be far enough from the road to have peace and quiet. The property manager Kathleen was very responsive with reservations and questions. The house had a split floor plan with 2 master bedroom suites on opposite sides with the kitchen, large dining area and livingroom in the center. Two sets of French doors lead out to the large porch with chairs, fire pit and hot tub. We loved the picnic table and ate all our meals outside enjoying the sunset and the sounds of the birds and frogs in the evening. So Peaceful! Paddlers retreat is centrally located between zip lining, white water rafting and mountain biking in Tsali. If you're around for a weekend, check out the Kudzu bar just down the road for great bluegrass music and dancing. We found our clean, comfortable home away from home!